Chronic pain was part of my daily life for over 3 years. This was after I had major neck surgery to remedy the issues I was experiencing, which were 3 ruptured discs in my cervical vertebra. I was in the dark about what the source of this pain was for several months before finding a doctor that could properly diagnose me. At that point, I was at my wit's end with the daily pain, and I was willing to do practically anything to lessen or get rid of it entirely. The doctor assured me that after the procedure the pain would subside, and I would be back to 'normal' in a matter of months after my surgery. Having felt like I exhausted all of my other options, I decided to go through with the surgery. That was 4 years ago. Today (Jan 31st), is the anniversary of that surgery. It seems sort of morbid for me to celebrate such a painful time in my life, especially since it completely changed everything about how I chose to live and what I was capable of doing physically. One thing that I missed terribly was my ability to rock climb. Before the neck issues, I climbed about 5 days a week—it was a huge part of my life. Even though I was left with a void that climbing could no longer fill, I was eventually ushered onto a new path that brought me to where I am today. I overcame many obstacles during that time period that were extremely difficult for me to come to terms with. Now, I see how necessary it was for me to shed my old ways in order to be open to all the new experiences I wanted to have in my life. When I no longer had the ability to rock climb, I had more time to devote to photography. Reigniting my passion for taking pictures was one of the greatest gifts to come from this life-altering experience. Now, I look back on what happened as a blessing. Not only did this experience guide me to a path where I am finally following my dreams, but it also helped draw me closer to a partner who has been there for me through thick and thin. Chronic pain can get the best of you sometimes if you don't have the will to fight against it; Cody was a real trooper when I had bad days. I'm very grateful that Cody has stuck by me through the good and bad. It wasn't until April 2010 that those 'bad days' became few and far between. A friend introduced me to Yoga, and I've been practicing it almost daily since that time. There were moments when I felt as though the chronic pain would never go away. I consider myself extremely lucky that I could find a way to make that happen (finally). There were many occasions during the days of chronic pain that people suggested I take up Yoga, but I pretty much ignored their willingness to offer assistance. I'm glad that I finally wised up and changed this painful pattern once and for all. This past year has most definitely been a time for healing—physically, mentally, and emotionally. It's so nice to look back on this time last year when I had no idea that the discomfort I was experiencing would diminish. It's a reminder to me that something that is bothering or worrying you today won't necessarily be there as you get further down the road. The fact that I'm sitting in front of this computer without a stitch of pain is a testament to the fact that things don't always stay the same, even if we feel as though nothing is changing. 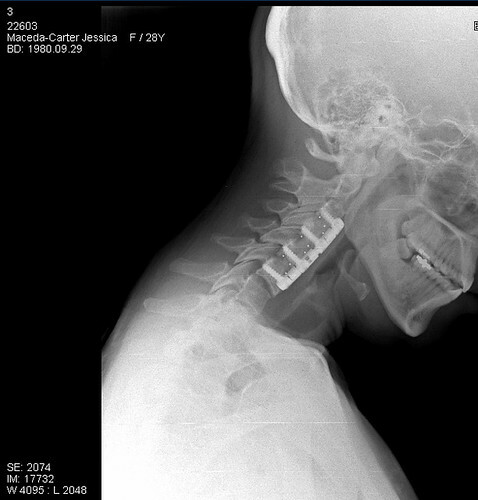 January 31st, 2011 I will gladly celebrate my neck surgery anniversary because, in a way, even though it could be considered one of the worst things to happen in my life (so far), it's also one of the best things to have happened to me, too. tears of joy... so glad that you are celebrating & healing - adieu pain in the neck! My sister deals with chronic pain due to fibromyalgia. Do you have any advice on how I can best be of support to her? Wow...how amazing that you have been through such a scary time and thankfully you are doing so much better! I wouldn't know...you look so beautiful and healthy!!! So glad you found something that brought you to your current place of healing! it encourages me to see how you have found your way through. really amazing, I admire your strength.